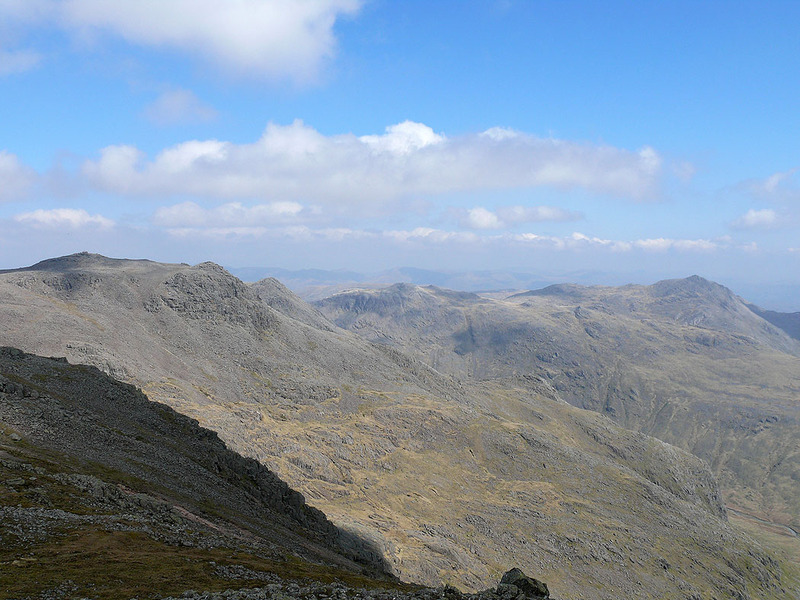 Only my second ever ascent of Scafell done on a fine spring day. 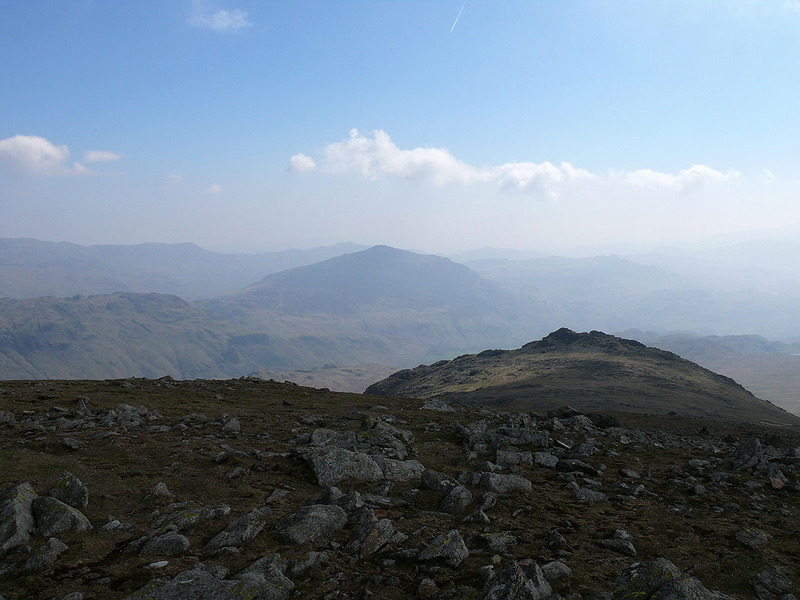 Hazy though, so no long distance views. 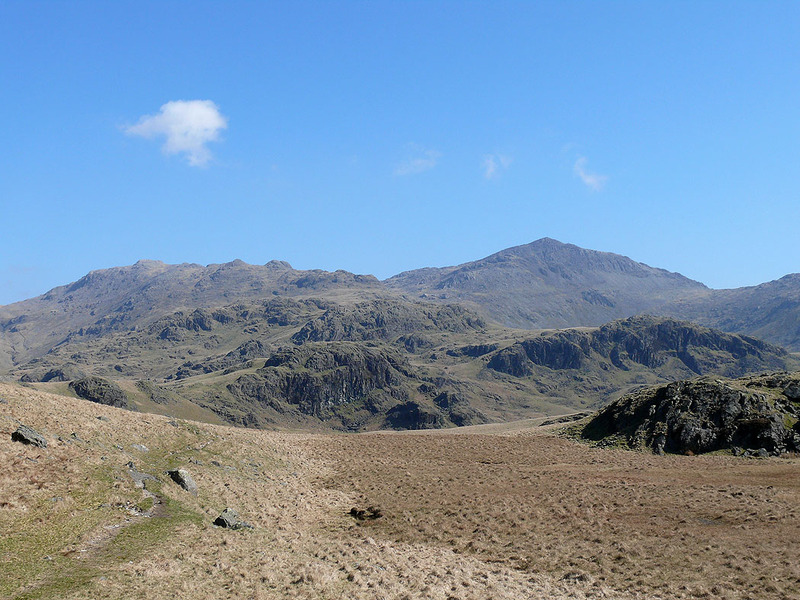 I parked in the little car park opposite Wha House Farm in Eskdale for the start of this walk. 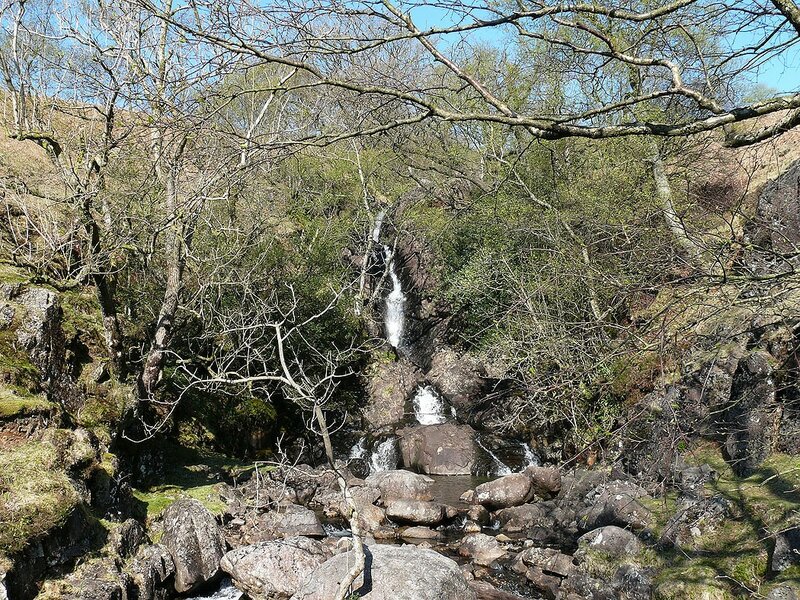 I then took the footpath past Taw House to reach Scale Bridge and the zig-zags up by Scale Beck. 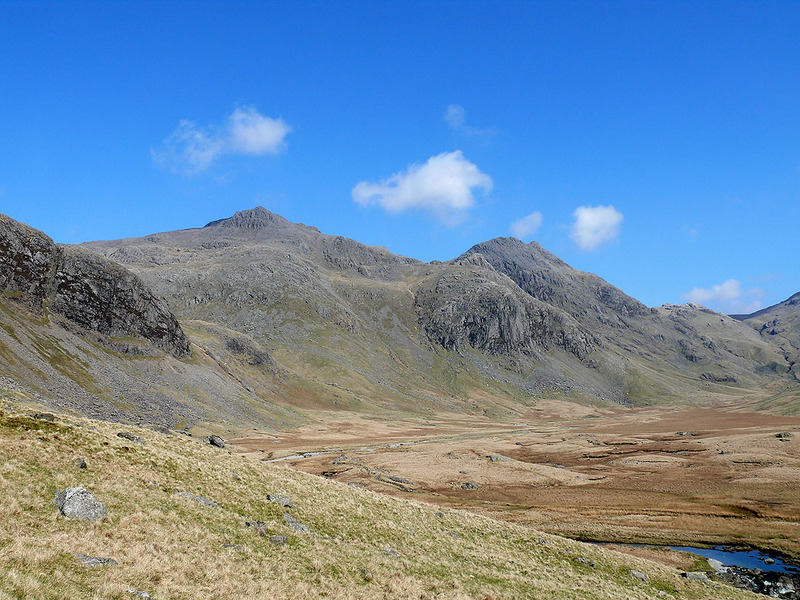 The path was then followed into upper Eskdale to reach Sampson's Stones and then Cam Spout. 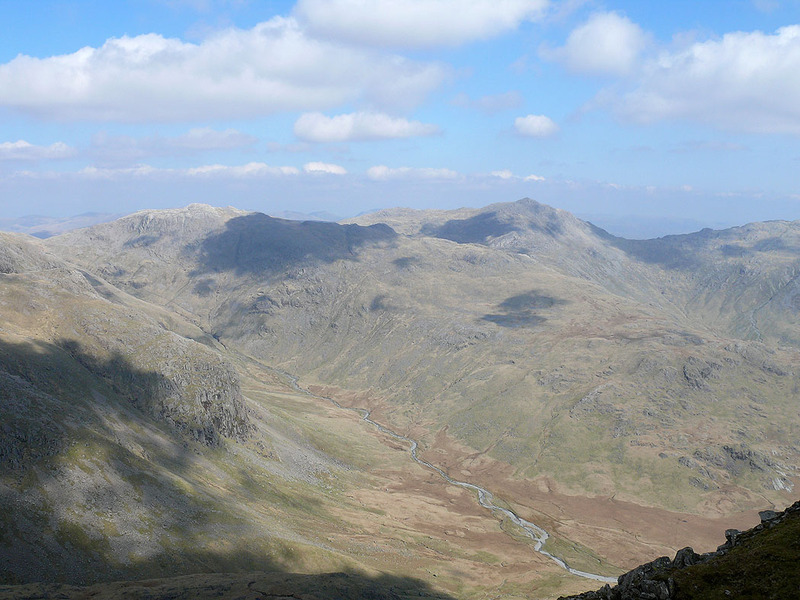 I climbed up past Cam Spout to reach the gully to Foxes Tarn, from where I made the ascent of Scafell via Foxes Tarn. 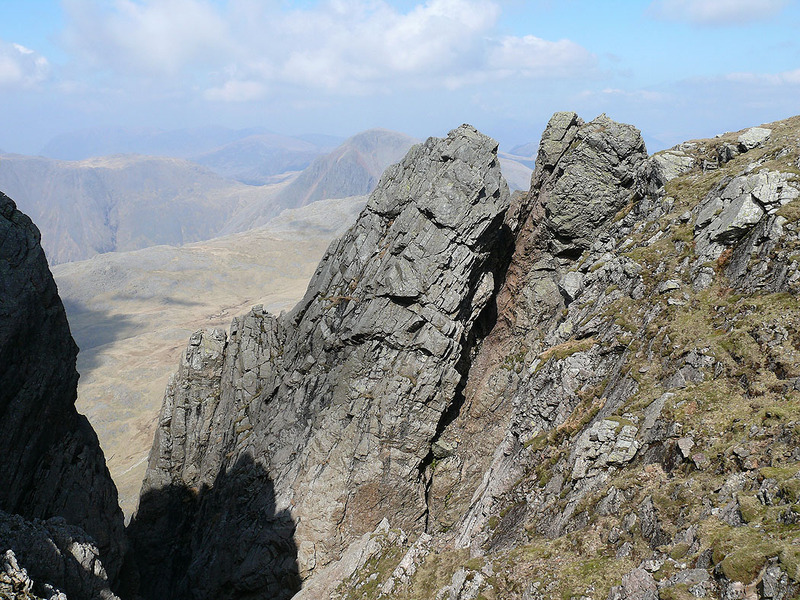 While at the summit I paid a visit to Symonds Knott to have a look at the rock architecture of Scafell Crag. 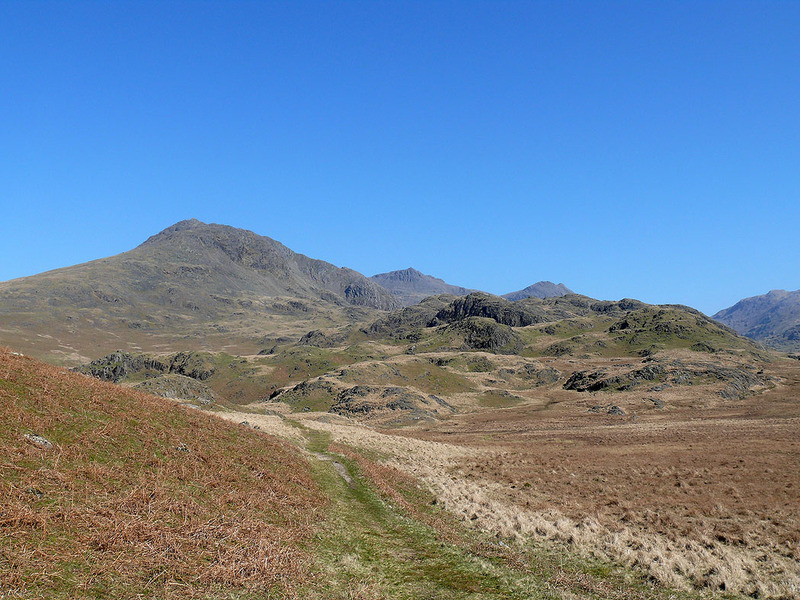 My route of descent was by Long Green, Slight Side and the Terrace Route back to Eskdale. 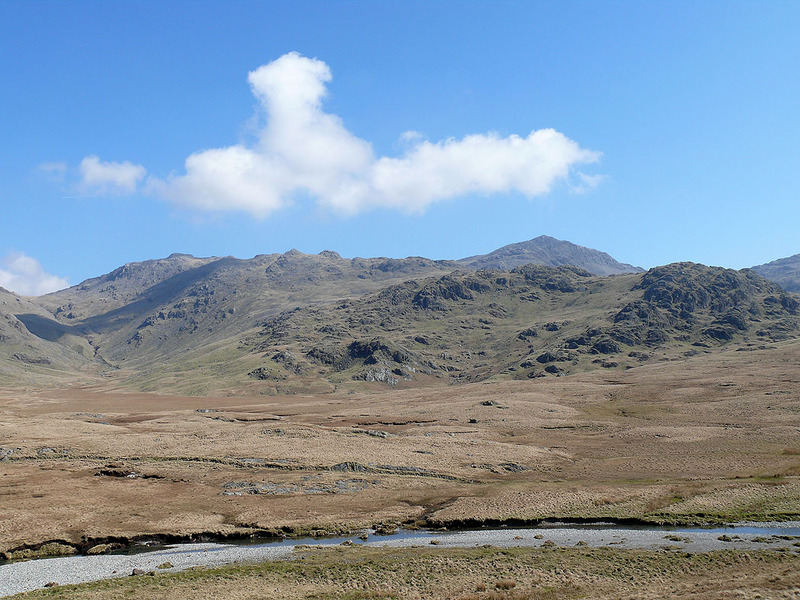 A view up Eskdale from near Scale Bridge. 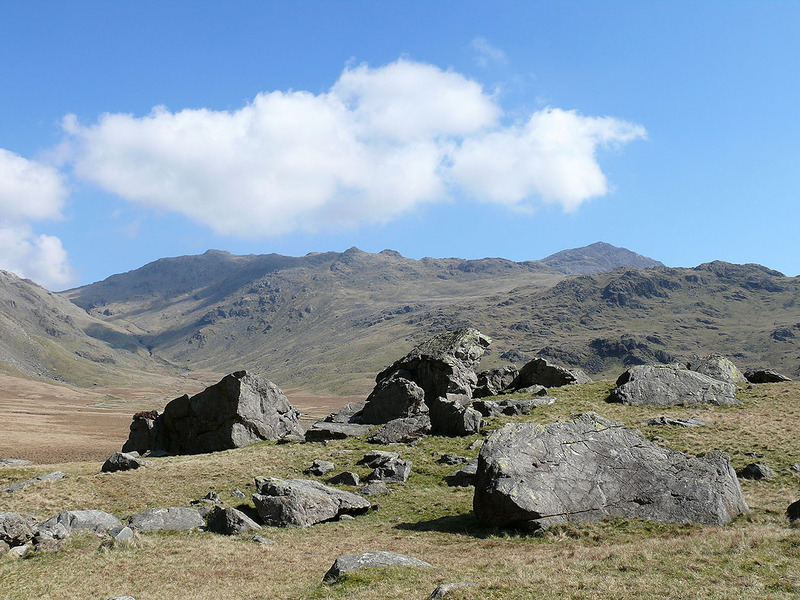 The crag on the left is Heron Crag. 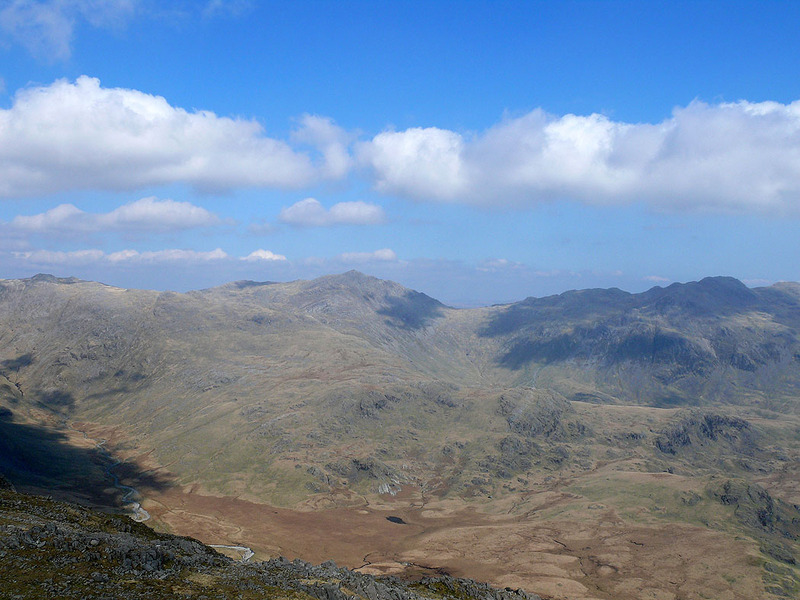 Above the zig-zags and the first view of the high fells ahead. 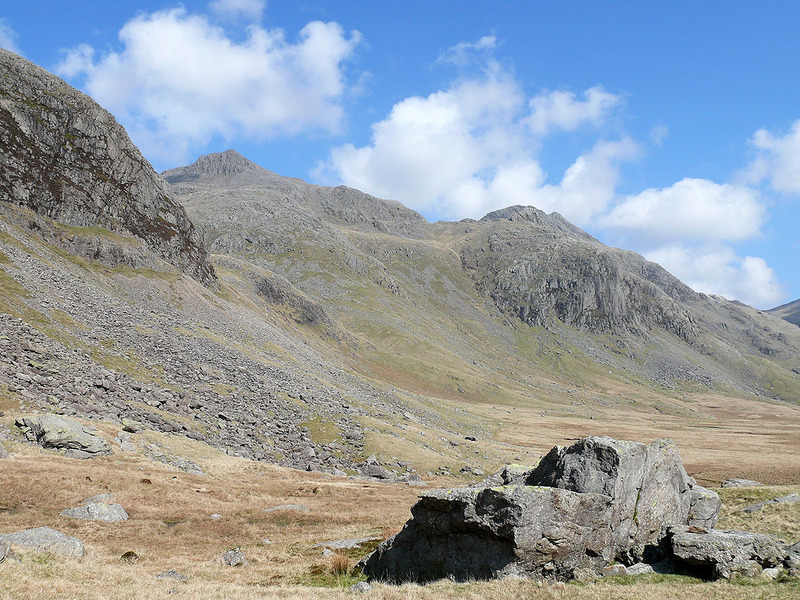 Scafell, Scafell Pike and Ill Crag behind Silverybield Crag. Around a corner and I reach Great Moss. 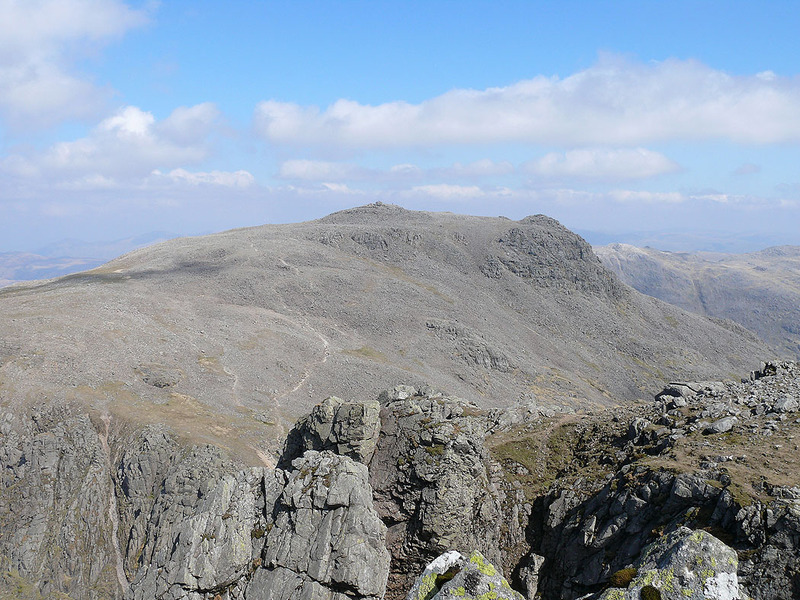 Scafell Pike, Ill Crag and the crag of Eskdale Buttress, named Dow Crag on the OS map. 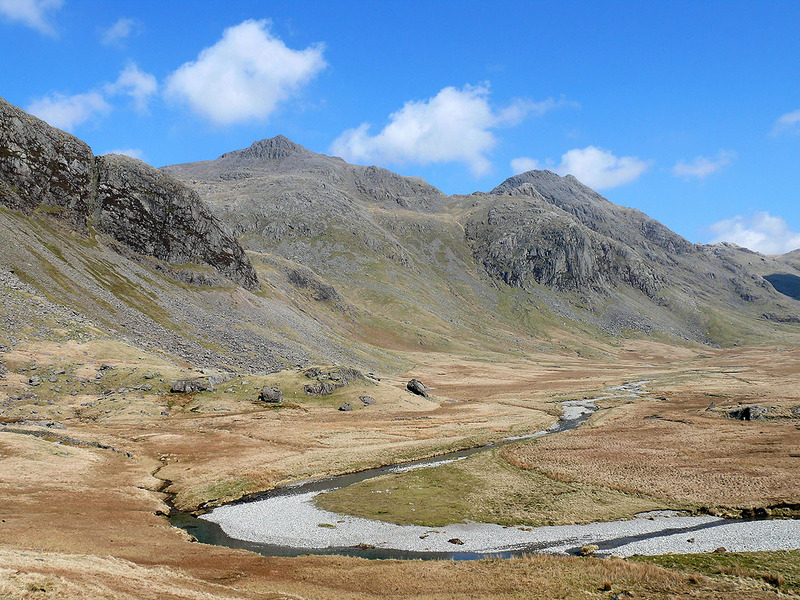 and the same view across a bend in the River Esk. 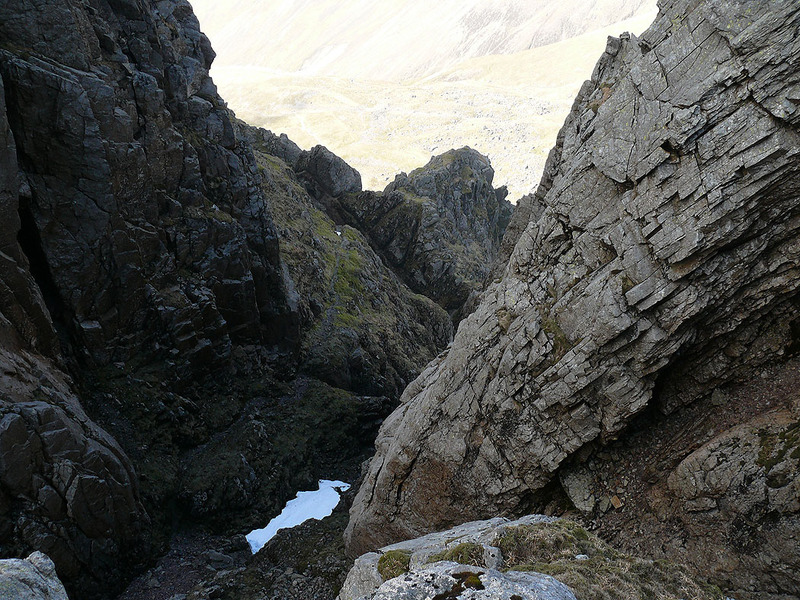 Sampson's Stones are below Cam Spout Crag on the left. 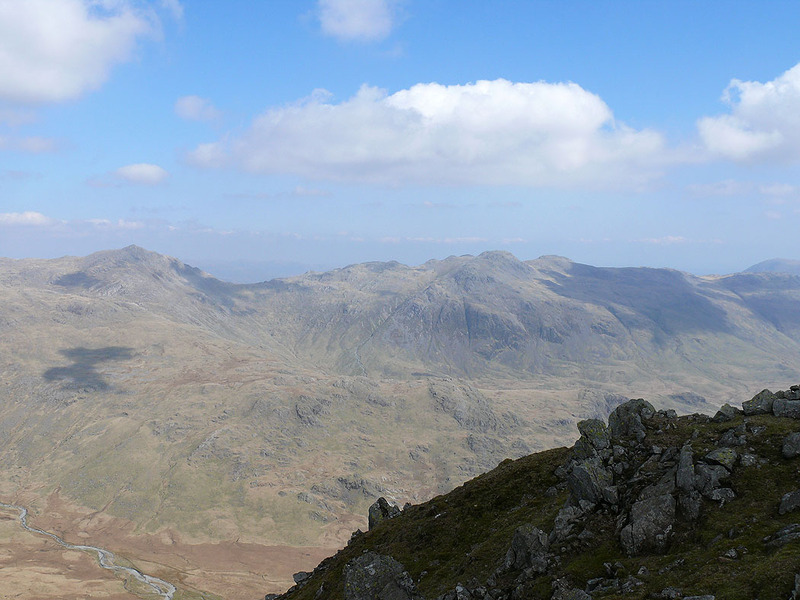 The same views from Sampson's Stones.. 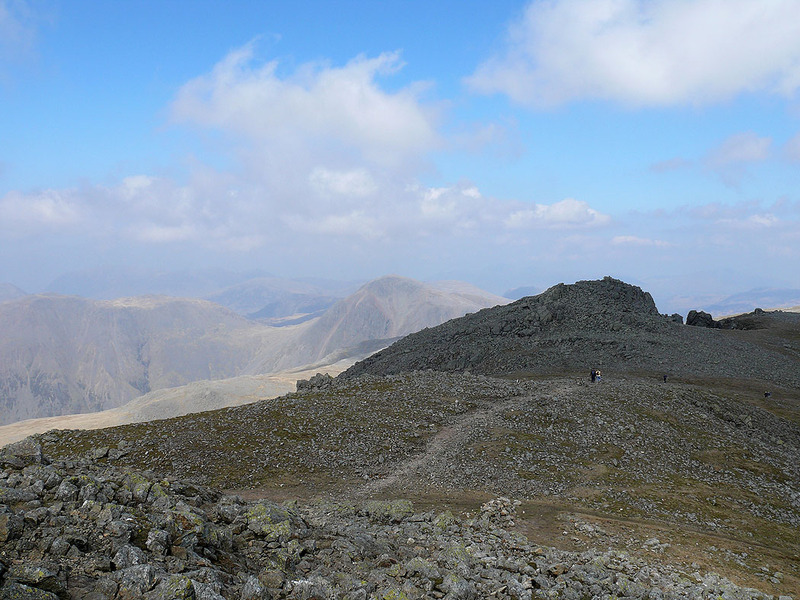 I've finally arrived at the summit of Scafell. 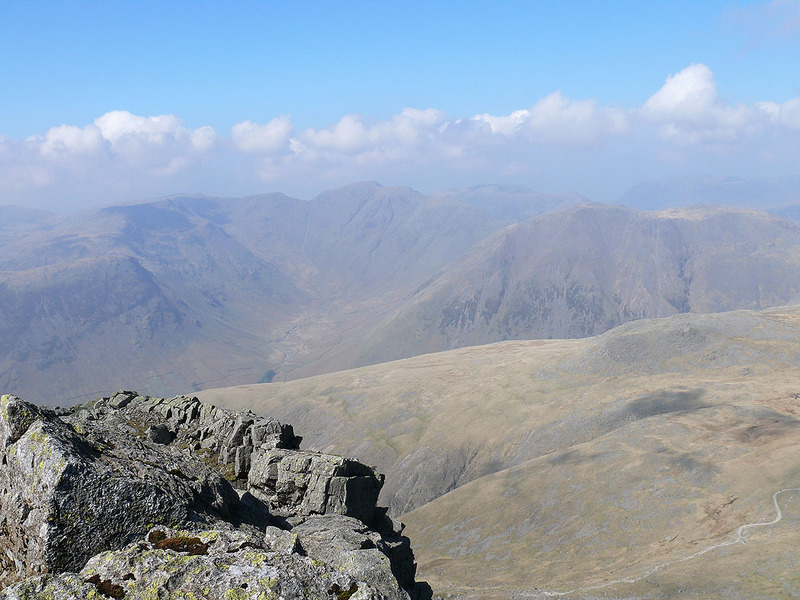 A short distance away is Symonds Knott with Great Gable behind to the left. 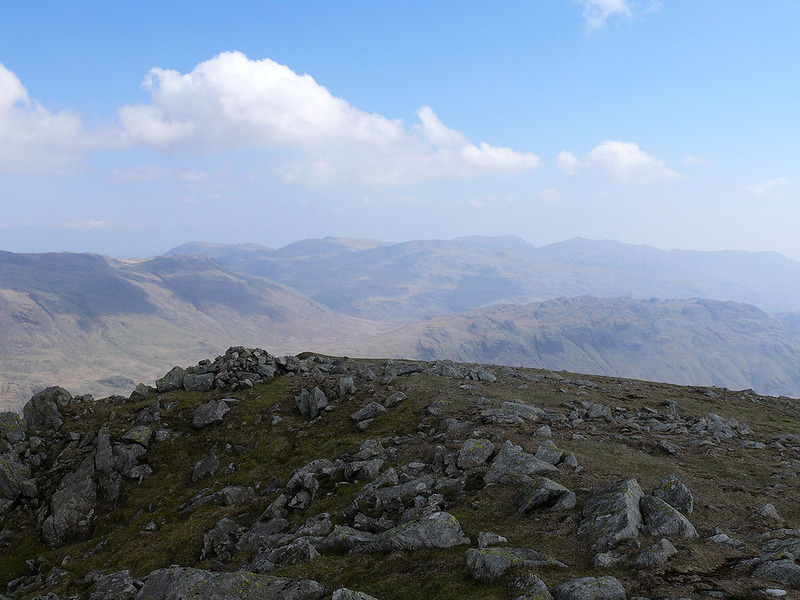 Scafell Pike from Symonds Knott. 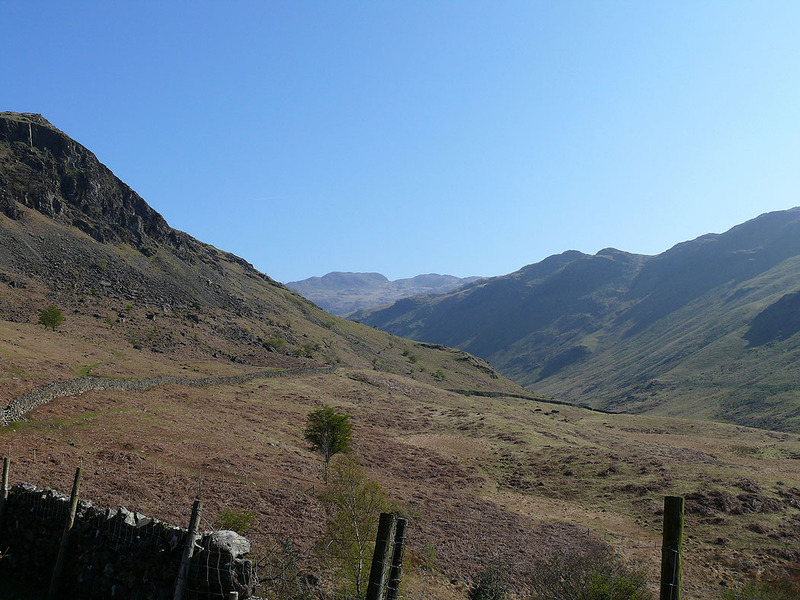 Symonds Knott is only a short distance from the summit and it's well worth paying it a visit for the views and the chance to have a look down Deep Gill. 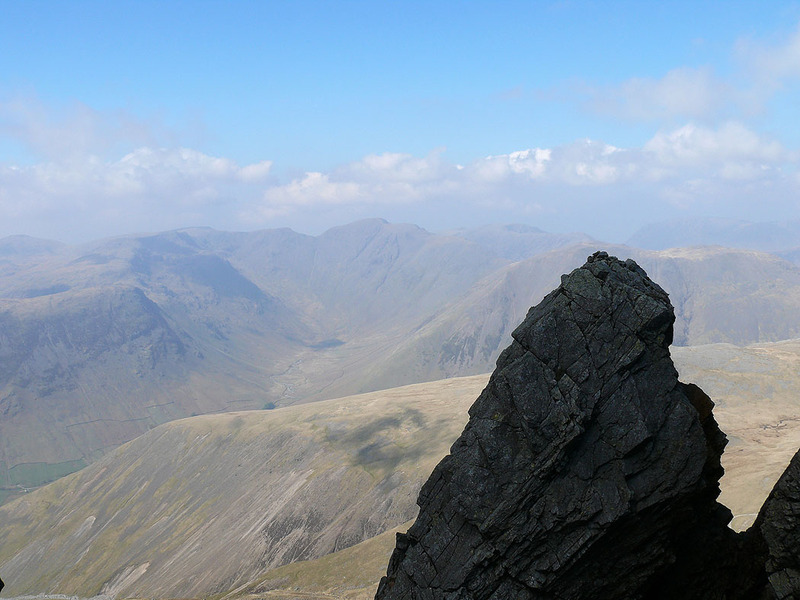 Great Gable. 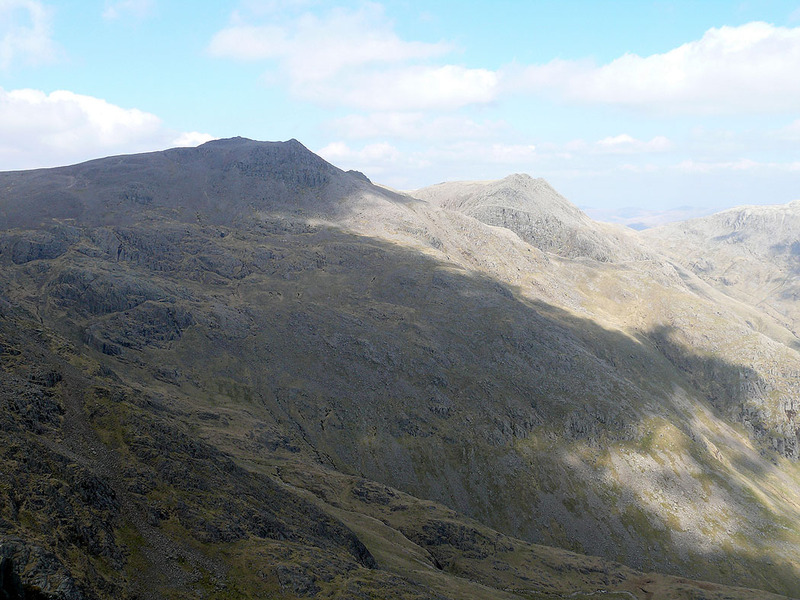 The obvious path below is the popular route up Scafell Pike from Wasdale Head. 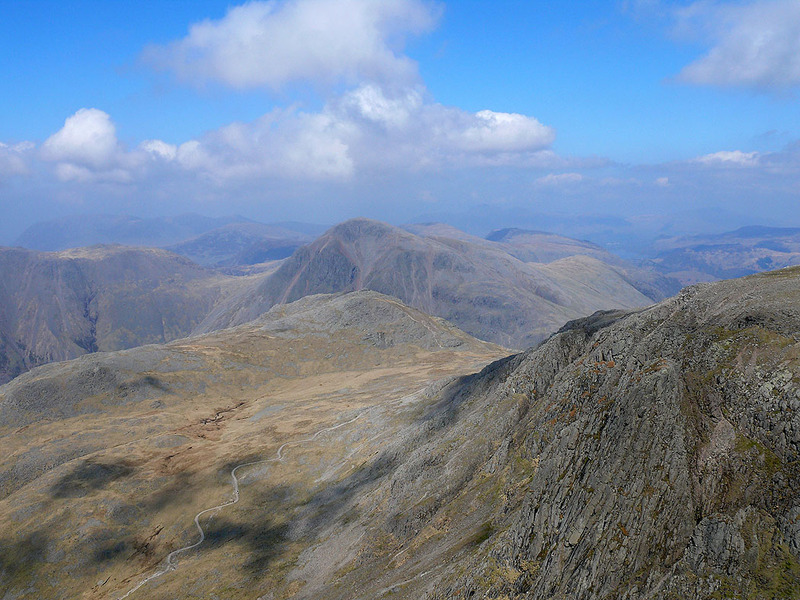 I've started on my way back and I'm on the subsidiary top of Long Green. 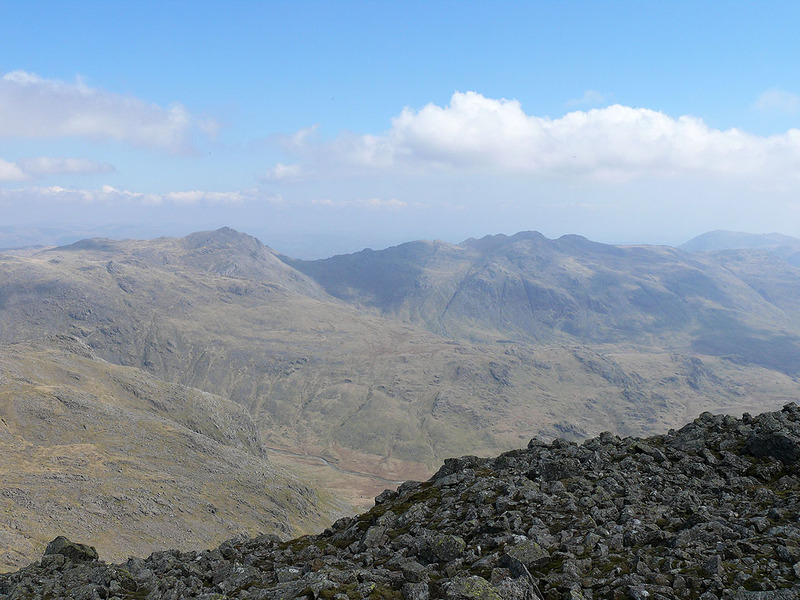 The view across upper Eskdale to Esk Pike and Bowfell. 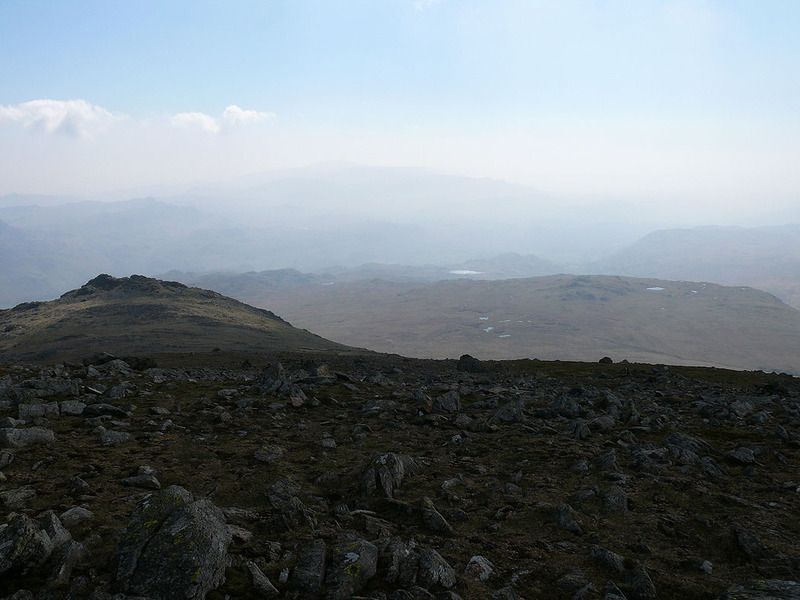 A very hazy view to the south. 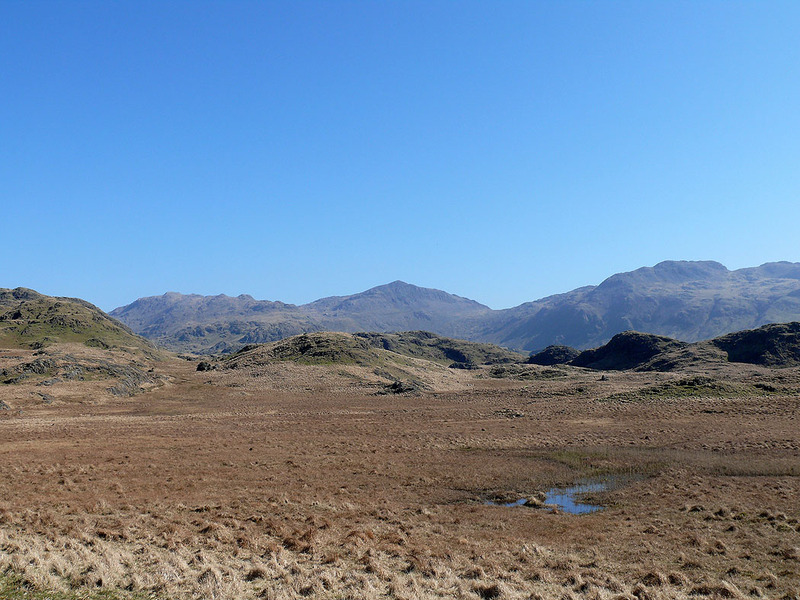 The largest patch of water is Stony Tarn beyond Eskdale Fell. 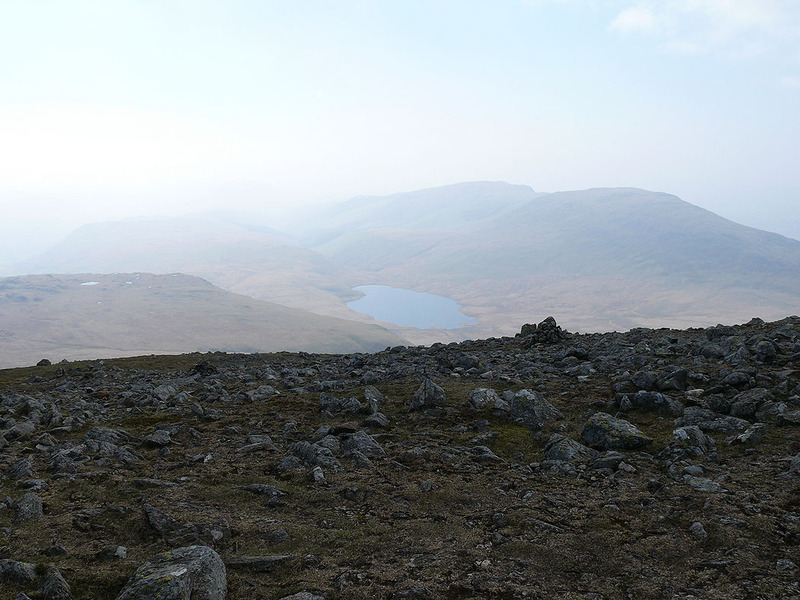 The last summit of the day, Slight Side. 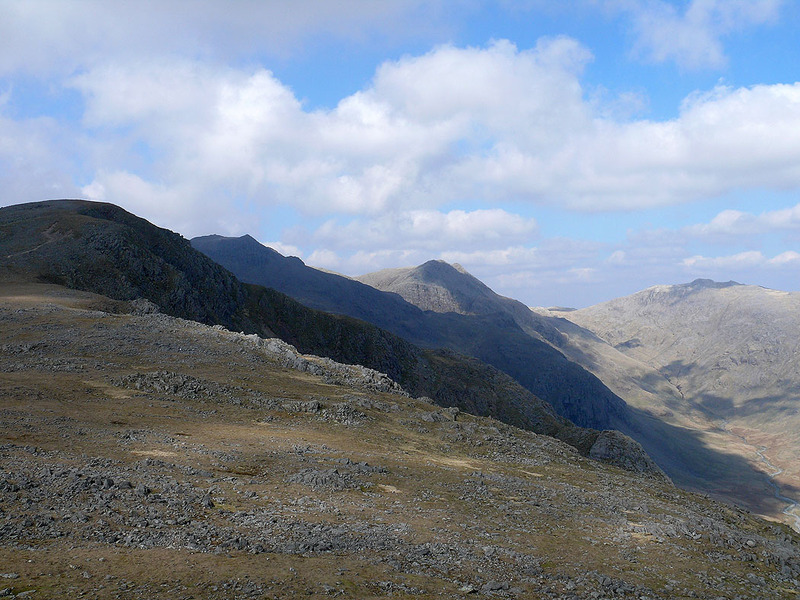 The path back up to Long Green can be seen on the left then the summits of Scafell Pike, Ill Crag and Esk Pike.